We began the trip at Quinta das Netas, which is Paul Symington’s own property, and where he lives with his wife Jane. It’s one of the Quintas that provides grapes for Warre’s Port. This is a beautiful spot, at the top of Cavadinha at an altitude of 350–480 metres, deep in the Pinhão valley, with views across to Noval. 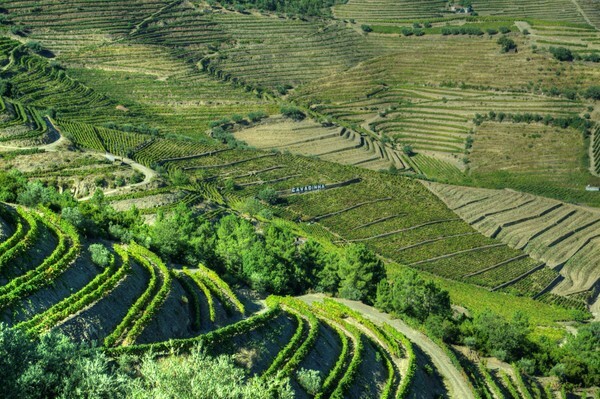 Neighbouring Netas is Quinta do Alvito, another smaller vineyard, also owned by the family. Cavadinha, the flagship Warre Quinta is known for making elegant wines, and this leads the house style of Warre. It’s a 30 hectare vineyard, with altitude ranging from 100–250 metres. There’s also a 2.5 hectare experimental vineyard here, which we visited with viticulturists Miles Edlmann and Pedro da Costa. This is where clones and varieties are trialled, with enough vines to make experimental vinifications. We had some discussion about Sousão, a Douro variety that makes unusually deep coloured wines. I had been under the impression that it was a teinturier—a red-fleshed variety. However, Miles showed me the difference between Sousão and Alicante Bouschet (a true red-fleshed variety that is widely grown in the Alentejo, and which is in the experimental vineyard). By comparison with Alicante, it’s clear that Sousão is not a teinturier, but just has very thick, highly pigmented skins that release a lot of colour. A third of the vines at Cavadinha are over 30 years old, and over a quarter of the vines are Touriga Nacional, which is an unusually high proportion for the Douro. Other Quintas in the Warre portfolio are Retiro Antigo in the Rio Torto valley, and Quinta de Telhada in the Douro Superior, which is a 32 hectare vineyard with a high proportion of Touriga Nacional (this was purchased from Cockburn in 2006). Some history. William Warre, who was to found a significant family Port dynasty, arrived in Portugal in 1829, but the company which bears the Warre name can trace its history back to 1670, making it the oldest British-owned Port house. The Symington family became involved in the late 19th century, and Warre’s is now part of their impressive portfolio (they bought the last of the Warre family shares in 1961). Dense and earthy with some robust, rustic notes. Dense and evolved, this doesn’t have the elegance of the 1996.